This page is about the city in the Canadian province of Quebec. For other uses, see Montreal (disambiguation). 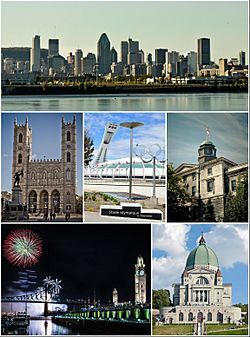 Montreal ( i/ˌmʌntriːˈɒl/;), officially Montréal (French pronunciation: [mɔ̃ʁeal]) is the most populous municipality in the Canadian province of Quebec and the 2nd-most populous in Canada as a whole. Originally called Ville-Marie, or "City of Mary," it is believed to be named after Mount Royal, though there is some debate about this. The city occupies most of the Island of Montreal as well as many smaller peripheral islands, most significantly Île Bizard. The city has a distinct four-season continental climate, with warm-to-hot summers and cold, snowy winters. In 2016, Montreal had a population of 1,704,694. Montreal's metropolitan area had a population of 4,098,927 and a population of 1,958,257 in the urban agglomeration, with all of the municipalities on the Island of Montreal included. Legally a French-speaking city, 60.5% of Montrealers speak French at home, 21.2% speak English and 19.8% speak neither. Montreal is one of the most bilingual cities in Quebec and Canada, with 56% of the population able to speak both official languages. Montreal is the second-largest primarily French-speaking city in the world after Paris. Historically the commercial capital of Canada, it was surpassed in population and economic strength by Toronto in the 1970s. It remains an important centre of commerce, aerospace, finance, pharmaceuticals, technology, design, education, culture, tourism, gaming, film and world affairs. Being the location of the headquarters of the International Civil Aviation Organization, Montreal is one of three North American cities home to organizations of the United Nations (along with New York and Washington) and also has the 2nd-highest number of consulates in the continent. 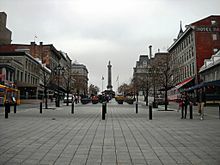 Montreal was also named a UNESCO City of Design. 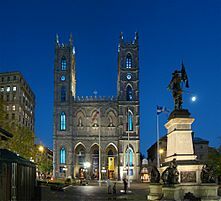 In 2009, Montreal was named North America's leading host city for international association events, according to the 2009 preliminary rankings of the International Congress and Convention Association (ICCA). According to the 2015 Global Liveability Ranking by the Economist Intelligence Unit, Montreal ranked 14th out of 140 cities. In the 2017 edition of their Best Student Cities ranking, Quacquarelli Symonds (QS) ranked Montreal as the world's best city to study abroad. Also, Montreal has 11 universities with 170,000 students enrolled. The Greater Montréal region has the highest number of university students per capita among all metropolitan areas in North America. It even ranks higher than Boston, the intellectual capital of the U.S.
Montreal has hosted multiple international conferences and events throughout its history, including the 1967 International and Universal Exposition and the 1976 Summer Olympic Games. It is the only Canadian city to have held the Summer Olympics. Currently, the city hosts the Canadian Grand Prix of Formula One, the Montreal International Jazz Festival and the Just for Laughs festival. In 2012, Montreal was ranked as a Beta+ world city. In Kanien’kéha, or Mohawk language, the island is called Tiohtià:ke Tsi (a name referring to the Lachine Rapids to the island's southwest) or Ka-wé-no-te. In Anishinaabemowin, or Ojibwe language, the land is called Mooniyaang ("the first stopping place"), part of the Seven Fires Prophecy. 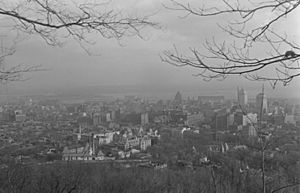 Though the city was first named by French colonizers Ville Marie, or "City of Mary," its current name comes from Mount Royal, the triple-peaked hill in the heart of the city. The most popular theory is that the name derives from Mont Réal, (Mont Royal in modern French, although in 16th-century France the terms réal and royal were used interchangeably); Cartier's 1535 diary entry, naming the mountain, refers to "le mont Royal". Another theory is that the name was adopted as it is written nowadays because an early map of 1556 used the Italian name of the mountain, "Monte Real", but this has been dismissed by the Commission de toponymie du Québec. 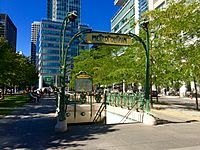 According to the Commission de toponymie du Québec and the Geographical Names Board of Canada, Canadian place names have only one official form. Thus, Montreal is officially spelled with an acute accent over the "e" (Montréal) in both English and French. In practice, this is mostly limited to governmental uses. English-speaking Montrealers, including English-language media, regularly omit the accent when writing in English. Archaeological evidence demonstrates that First Nations native people occupied the island of Montreal as early as 4,000 years ago. By the year AD 1000, they had started to cultivate maize. Within a few hundred years, they had built fortified villages. The Saint Lawrence Iroquoians, an ethnicity distinct from the Iroquois nations of the Haudenosaunee then based in present-day New York, established the village of Hochelaga at the foot of Mount Royal two centuries before the French arrived. Archeologists have found evidence of their habitation there and at other locations in the valley since at least the 14th century. The French explorer Jacques Cartier visited Hochelaga on October 2, 1535, and estimated the population of the native people at Hochelaga to be "over a thousand people". 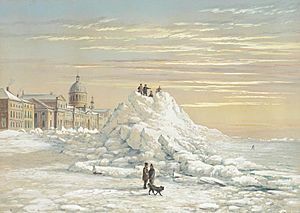 Ice pile in Front of the Market Building, Montreal, Quebec, c. 1854. The Montreal Harbour in 1889. In the 19th century maintaining Montreal's drinking water became increasingly difficult with the rapid increase in population. A majority of the drinking water was still coming from the city's harbor, which was busy and heavily trafficked leading to the deterioration of the water within. 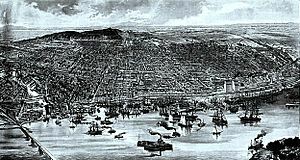 In the mid 1840s the City of Montreal installed a water system that would pump water from the St. Lawrence and into cisterns. The cisterns would then be transported to the desired location. This was not the first water system of its type in Montreal as there had been one in private ownership since 1801. In the middle of the 19th century water distribution was carried out by "fontainiers." The fountainiers would open and close water valves outside of buildings, as directed, all over the city. As they lacked modern plumbing systems it was impossible to connect all buildings at once and it also acted as a conservation method. The population was not finished rising yet however, from 58,000 in 1852 it rose to 267,000 by 1901. 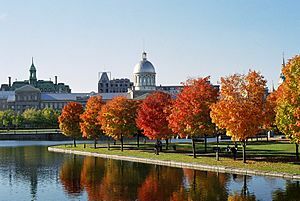 Montreal was the capital of the Province of Canada from 1844 to 1849, but lost its status when a Tory mob burnt down the Parliament building to protest the passage of the Rebellion Losses Bill. For strategic reasons, Queen Victoria herself established Ottawa as the capital. The reasons were twofold; as it was located more in the interior of the nation, it was less susceptible to US attack. Perhaps more importantly, as it lay on the border between French and English Canada, the then small town of Ottawa was seen as a compromise between Montreal, Toronto, Kingston and Quebec City, who were all vying to become the young nation's official capital. The 1970s ushered in a period of wide-ranging social and political changes, stemming largely from the concerns of the French speaking majority about the conservation of their culture and language, given the traditional predominance of the English Canadian minority in the business arena. The October Crisis and the 1976 election of the Parti Québécois, supporting sovereign status for Quebec, resulted in the departure of many businesses and people from the city. In 1976 Montreal was the host of the Olympics. During the 1980s and early 1990s, Montreal experienced a slower rate of economic growth than many other major Canadian cities. Montreal is classified as a humid continental climate (Köppen climate classification: Dfa/Dfb). Summers are, on the whole, warm and humid with a daily maximum average of 26 to 27 °C (79 to 81 °F) in July; temperatures in excess of 30 °C (86 °F) are common. Conversely, cold fronts can bring crisp, drier and windy weather in the early and later parts of summer. Winter brings cold, snowy, windy, and, at times, icy weather, with a daily average ranging from −9 to −10.5 °C (16 to 13 °F) in January. However, some winter days rise above freezing, allowing for rain on an average of 4 days in January and February each. Usually, snow covering some or all bare ground lasts on average from the first or second week of December until the last week of March. While the air temperature does not fall below −30 °C (−22 °F) every year, the wind chill often makes the temperature feel this low to exposed skin. Spring and fall are pleasantly mild but prone to drastic temperature changes; spring even more so than fall. Late season heat waves as well as "Indian summers" are possible. Early and late season snow storms can occur in November and March, and more rarely in April. Montreal is generally snow free from April 15 to November 15. The lowest temperature in Environment Canada's books was −37.8 °C (−36 °F) on January 15, 1957, and the highest temperature was 37.6 °C (100 °F) on August 1, 1975, both at Dorval International Airport. Italianate, 2nd Empire Homes on Saint Louis Square in Le Plateau-Mont-Royal. Some of the city's earliest still-standing buildings date back to the late 16th and early 17th centuries. 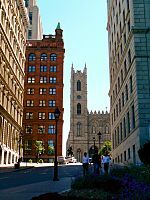 Although most are clustered around the Old Montreal area, such as the Sulpician Seminary adjacent to Notre Dame Basilica that dates back to 1687, and Château Ramezay, which was built in 1705, examples of early colonial architecture are dotted throughout the city. Situated in Lachine, the Le Ber-Le Moyne House is the oldest complete building in the city. In Point St. Charles visitors can see the Maison Saint-Gabriel, which can trace its history back to 1698. 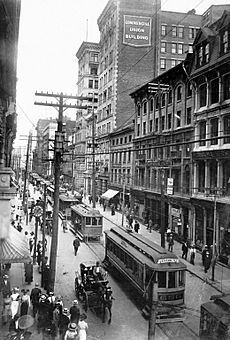 There are many historic buildings in Old Montreal in their original form: Notre Dame of Montreal Basilica, Bonsecours Market, and the 19th‑century headquarters of all major Canadian banks on St. James Street (French: Rue Saint Jacques). 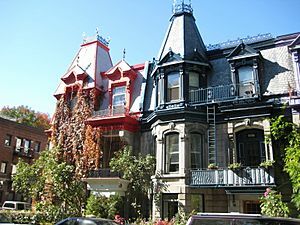 Montreal's earliest buildings are characterized by their uniquely French influence and grey stone construction. 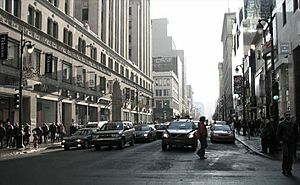 A view of Saint Catherine Street in Downtown Montreal. 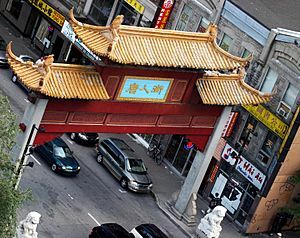 Entrance gate to Montreal's Chinatown on Saint Laurent Boulevard. Beaver Lake on Mount Royal. The park contains two belvederes, the more prominent of which is the Kondiaronk Belvedere, a semicircular plaza with a chalet, overlooking Downtown Montreal. Other features of the park are Beaver Lake, a small man-made lake, a short ski slope, a sculpture garden, Smith House, an interpretive centre, and a well-known monument to Sir George-Étienne Cartier. The park hosts athletic, tourist and cultural activities. Based on current city limits. According to Statistics Canada, at the 2006 Canadian census the city had 1,620,693 inhabitants. A total of 3,635,571 lived in the Montreal Census Metropolitan Area (CMA) at the same 2006 census, up from 3,451,027 at the 2001 census (within 2006 CMA boundaries), which means a population growth of +1.05% per year between 2001 and 2006. In the 2006 census, children under 14 years of age (621,695) constituted 17.1%, while inhabitants over 65 years of age (495,685) numbered 13.6% of the total population. Visible minorities comprised 31.7% of the population in the 2011 census. The five most numerous visible minorities are Blacks (9.1%), Arabs (6.4%), Latin Americans (4.2%), South Asians (3.3%), and Chinese (2.9%). Visible minorities are defined by the Canadian Employment Equity Act as "persons, other than Aboriginals, who are non-white in colour". In 2009, the Greater Montreal Area was estimated to number 3.86 million people; by 2015, its population was estimated to have reached 4,060,700. According to StatsCan, by 2030, the Greater Montreal Area is expected to have a population of 5,275,000 with 1,722,000 being visible minorities. In terms of mother language (first language learned), the 2006 census reported that in the Greater Montreal Area, 66.5% spoke French as a first language, followed by English at 13.2%, while 0.8% spoke both as a first language. The remaining 22.5% of Montreal-area residents are allophones, speaking languages including Italian (3.5%), Arabic (3.1%), Spanish (2.6%), Creole (1.3%), Chinese (1.2%), Greek (1.2%), Portuguese (0.8%), Romanian (0.7%), Vietnamese (0.7%), and Russian (0.5%). 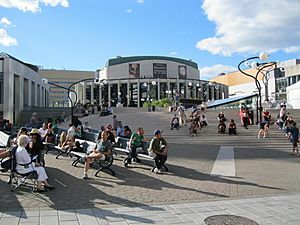 In terms of additional languages spoken, a unique feature of Montreal among Canadian cities, noted by Statistics Canada, is the working knowledge of both French and English possessed by most of its residents. Montreal has a strong industrial past, an important part of its culture. 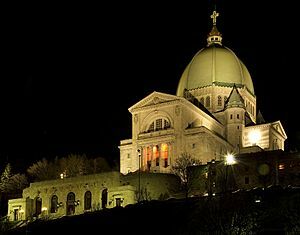 Saint Joseph's Oratory is the largest church in Canada. The island of Montreal is a hub for the Quebec Autoroute system, and is served by Quebec Autoroutes A-10 (known as the Bonaventure Expressway on the island of Montreal), A-15 (a.k.a. the Decarie Expressway south of the A-40 and the Laurentian Autoroute to the north of it), A-13 (a.k.a. Chomedey Autoroute), A-20, A-25, A-40 (part of the Trans-Canada Highway system, and known as "The Metropolitan" or simply "The Met" in its elevated mid-town section), A-520, and A-720 (a.k.a. the Ville-Marie Autoroute). Many of these Autoroutes are frequently congested at rush hour. However, in recent years, the government has acknowledged this problem and is working on long-term solutions to alleviate the congestion. One such example is the extension of Quebec Autoroute 30 on Montreal's south shore, which will serve as a bypass. One of the entrances to the Square-Victoria-OACI Metro station looks like a Paris Métro station. This original Hector Guimard gate was a gift from the city of Paris. The Metro was inaugurated in 1966 and has 68 stations on four lines. It is Canada's busiest subway system in total daily passenger usage, serving 1,050,800 passengers on an average weekday (as of Q1 2010). Each station was designed by different architects with individual themes and features original artwork, and the trains run on rubber tires, making the system quieter than most. The project was initiated by Montreal Mayor Jean Drapeau, who later brought the Summer Olympic Games to Montreal in 1976. 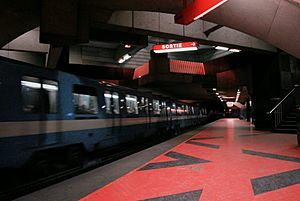 The Metro system has long had a station on the South Shore in Longueuil, and in 2007 was extended to the city of Laval, north of Montreal, with three new stations. Montréal-Pierre Elliott Trudeau International Airport. Montreal has two international airports, one for passengers only, the other for cargo. 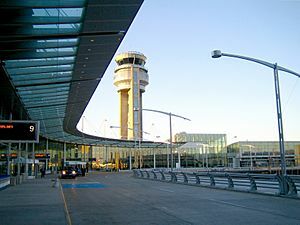 Pierre Elliott Trudeau International Airport (also known as Dorval Airport) in the City of Dorval serves all commercial passenger traffic and is the headquarters of Air Canada and Air Transat. To the north of the city is Montreal Mirabel International Airport in Mirabel, which was envisioned as Montreal's primary airport but which now serves cargo flights along with MEDEVACs and general aviation and some passenger services. In 2015, Trudeau was the third busiest airport in Canada by passenger traffic and fourth by aircraft movements, handling 15.5 million passengers, and 232,648 aircraft movements. With 60.8% of its passengers being on non domestic flights it has the largest percentage of international flights of any Canadian airport. Trudeau airport is served by 40 carriers to over 100 destinations worldwide. 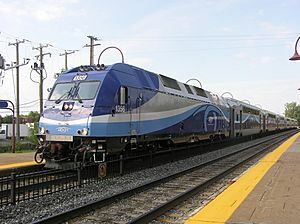 The Agence métropolitaine de transport runs commuter trains serving Greater Montreal such as this one on the Vaudreuil-Hudson Line. Canadian Pacific Railway (CPR), headquartered in Calgary, Alberta, was founded here in 1881. Its corporate headquarters occupied Windsor Station at 910 Peel Street until 1995. With the Port of Montreal kept open year-round by icebreakers, lines to Eastern Canada became surplus, and now Montreal is the railway's eastern and intermodal freight terminus. CPR connects at Montreal with the Port of Montreal, the Delaware and Hudson Railway to New York, the Quebec Gatineau Railway to Quebec City and Buckingham, the Montreal, Maine and Atlantic Railway to Halifax, and CN Rail. The CPR's flagship train, The Canadian, ran daily from Windsor Station to Vancouver, but all passenger services have since been transferred to Via Rail Canada and the Canadian terminates in Toronto. Montreal-based Canadian National Railways (CN) was formed during in 1919 by the Canadian government following a series of country-wide rail bankruptcies. It was formed from the Grand Trunk, Midland and Canadian Northern Railways, and has risen to become CPR's chief rival in freight carriage in Canada. Like the CPR, CN has divested itself of passenger services in favour of Via Rail Canada. CN's flagship train, the Super Continental, ran daily from Central Station to Vancouver, but after it was transferred to Via it was eliminated in 1990. The commuter rail system is managed and operated by the Agence métropolitaine de transport, and reaches the outlying areas of Greater Montreal with six lines. It carried an average of 79,000 daily passengers in 2014, making it the seventh busiest in North America following New York, Chicago, Toronto, Boston, Philadelphia, and Mexico City. On April 22, 2016, a new planned automated rapid transit system, the Réseau électrique métropolitain, was unveiled. The 67-kilometre-long (42 mi) network, consisting of four branches and 24 stations, is planned to be completed by late 2020 and will be the third largest automated rapid transit network, after the Dubai Metro and the Vancouver Skytrain. Most of it will be financed by pension fund manager Caisse de dépôt et placement du Québec. The Montreal World Trade Centre west entrance on Victoria Square. ICAO World Headquarters, Montreal, Quebec, Canada. Newsstand in Rosemont, Montreal, 1943. The Montreal Canadiens play the visiting Boston Bruins at the Bell Centre. Montreal Facts for Kids. Kiddle Encyclopedia.